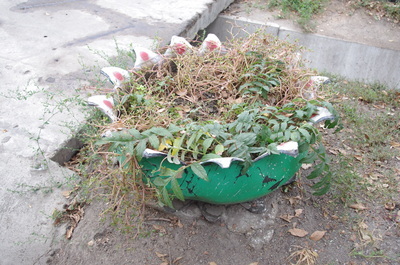 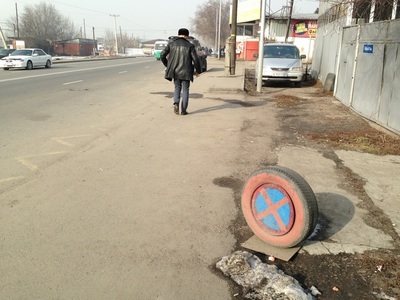 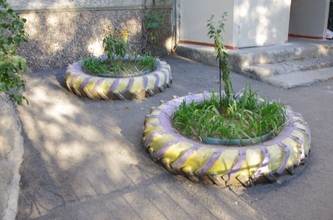 Though the feet-draggers in city hall haven't yet embraced recycling, Almaty's citizens are ahead of the curve. 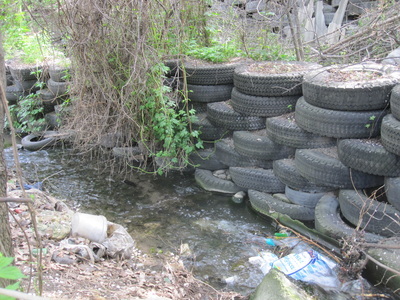 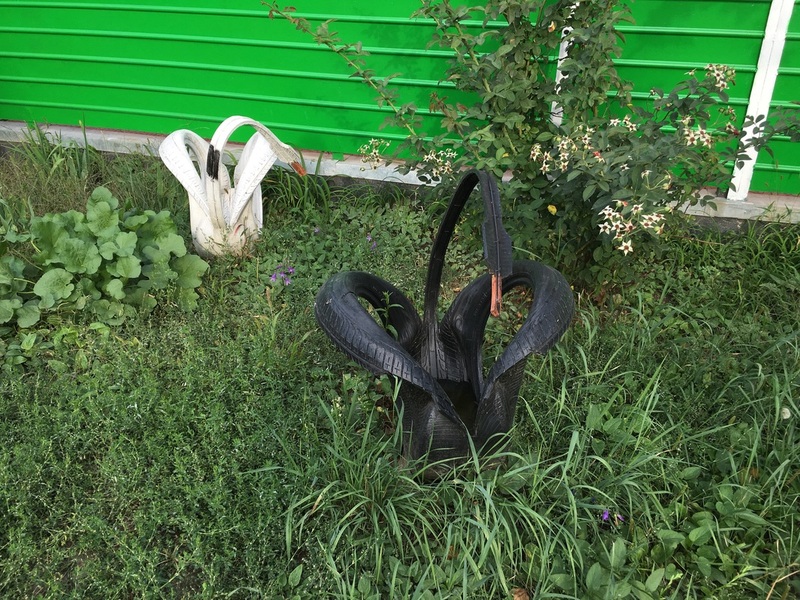 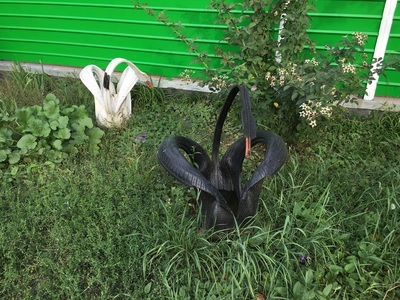 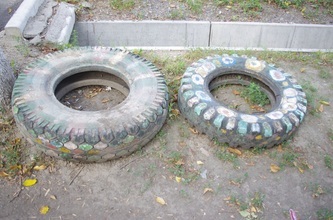 Soda bottles show up quite often, but it is the retired tire that reins as the city's icon of post-industrial reuse. 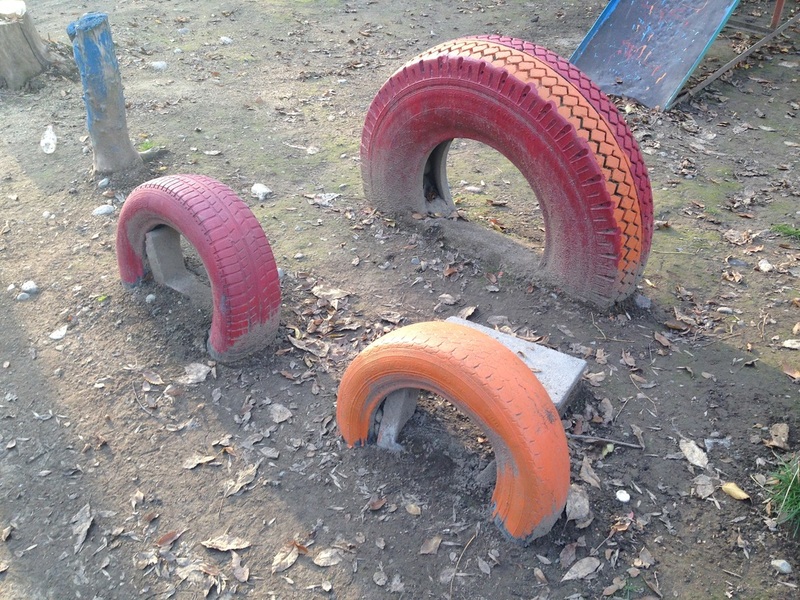 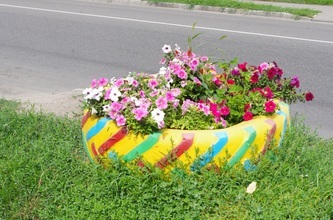 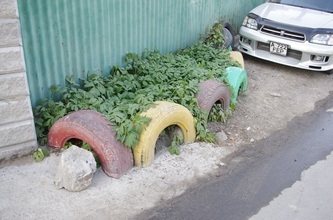 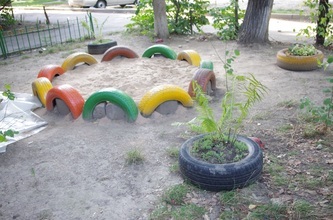 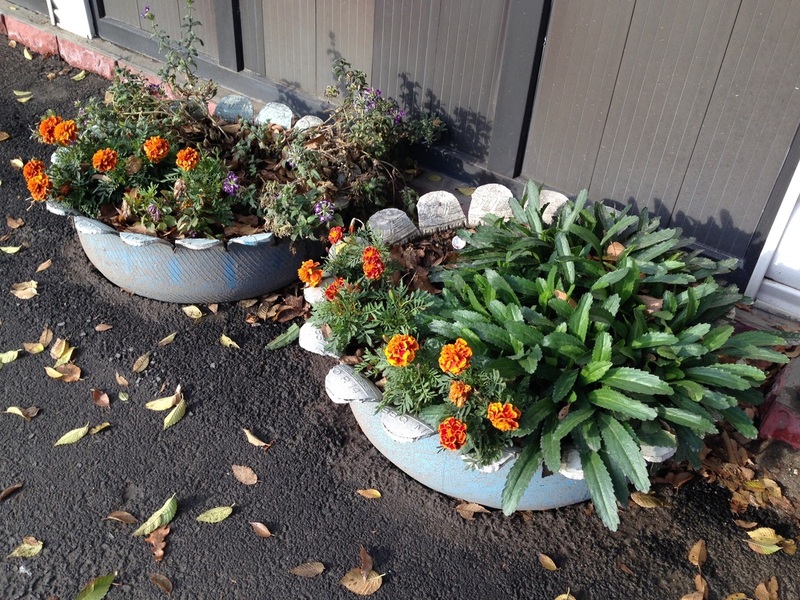 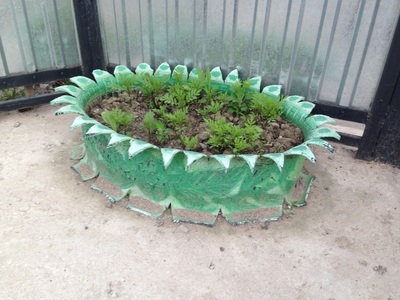 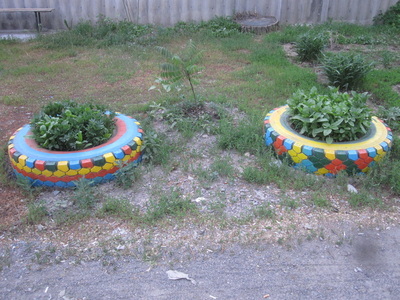 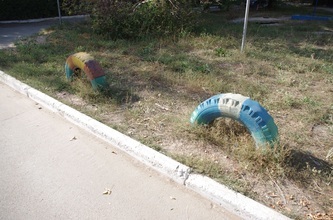 Tires are painted rainbow colors, filled with soil, and used as planters. 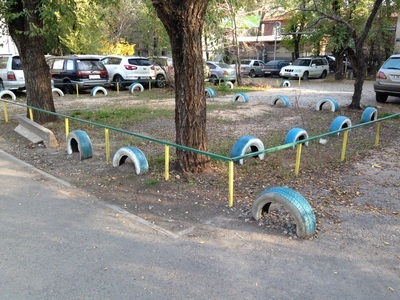 They line parking lots or courtyards to act as rubber dividers. 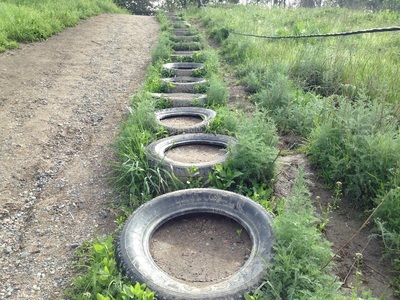 They're stacked to make retaining walls. 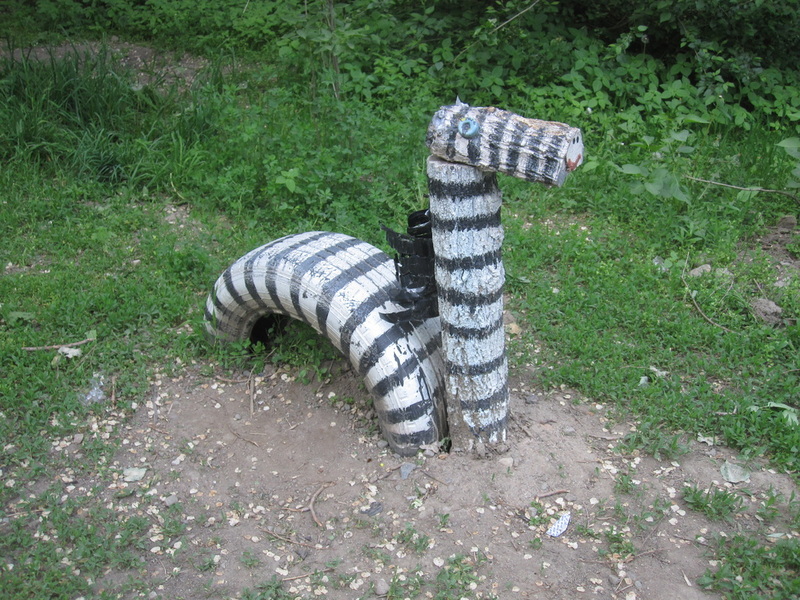 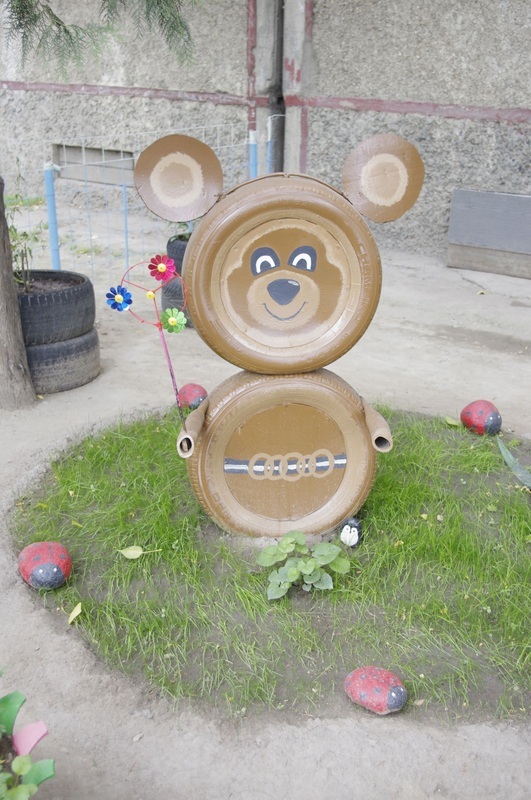 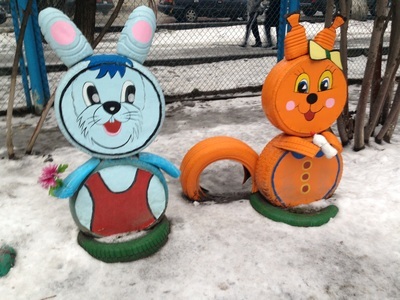 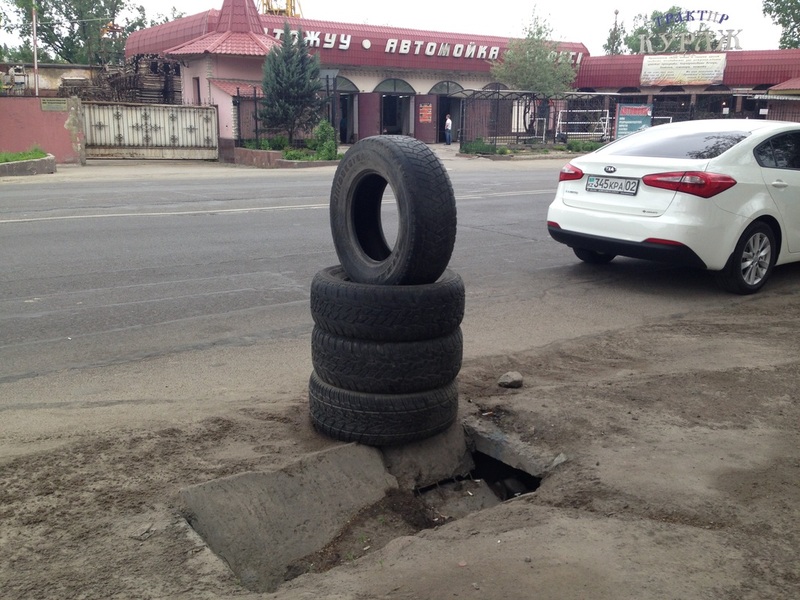 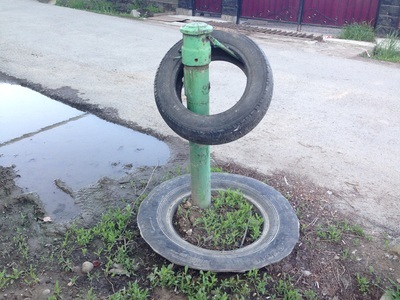 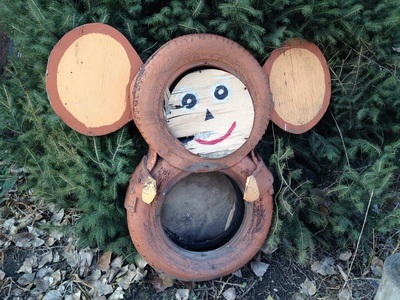 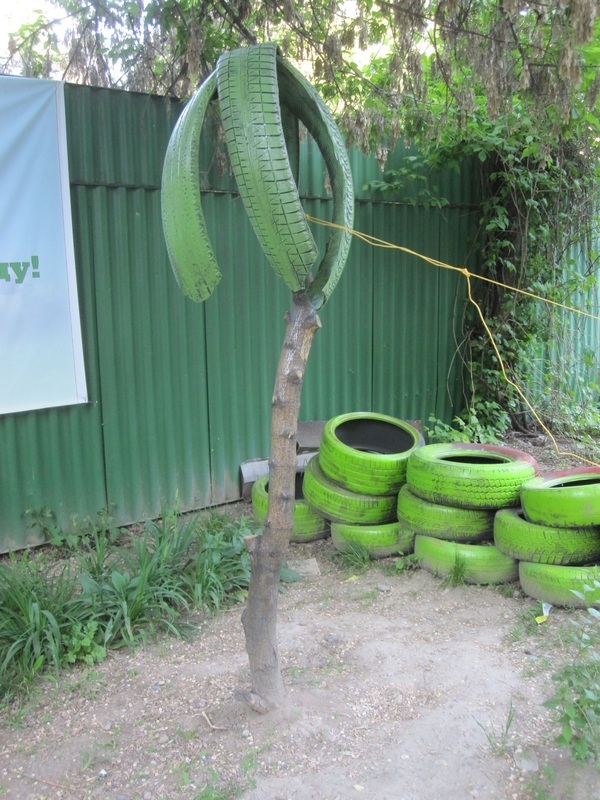 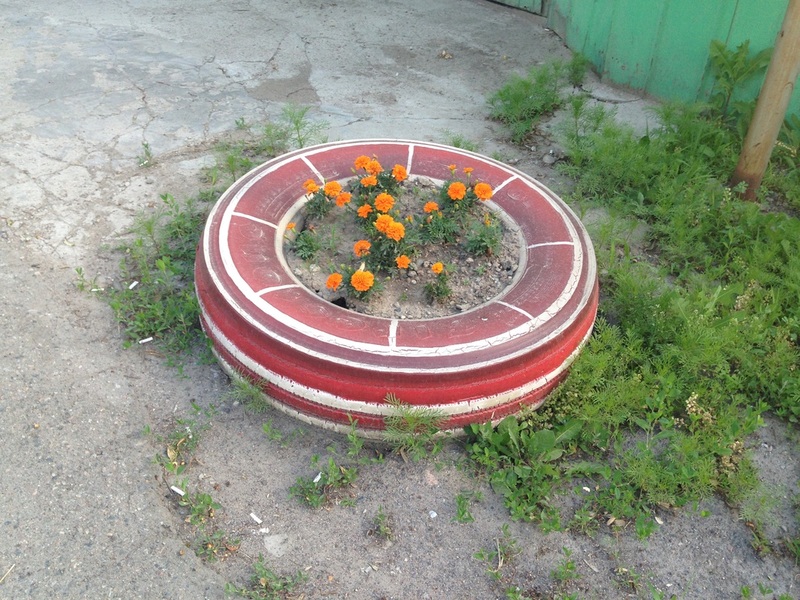 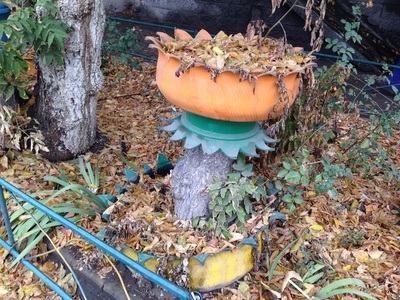 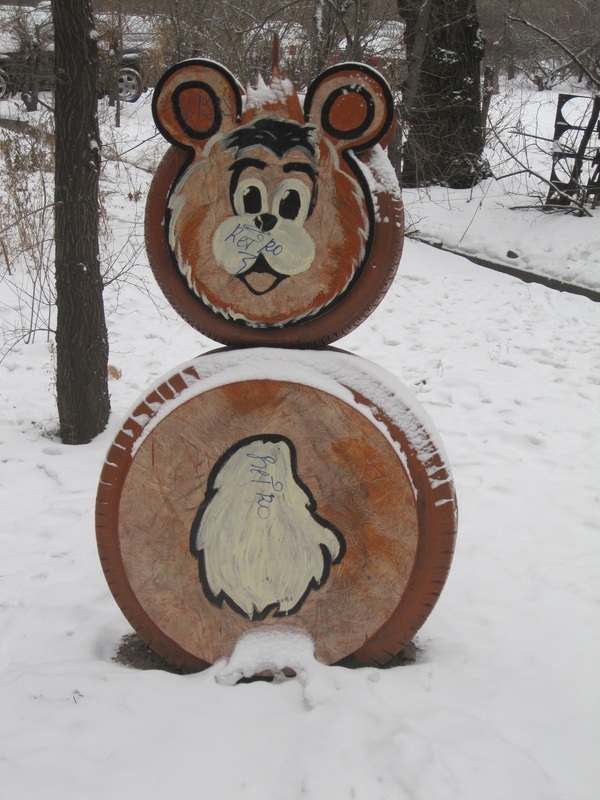 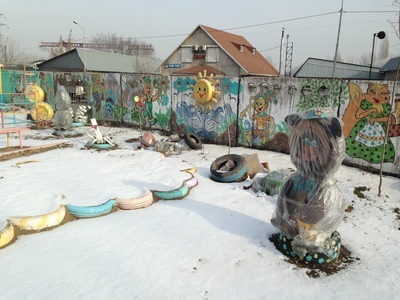 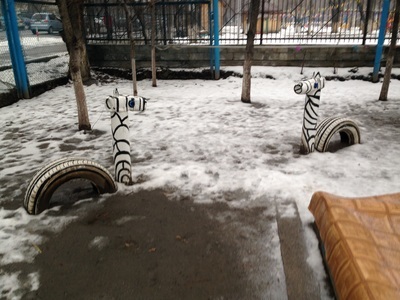 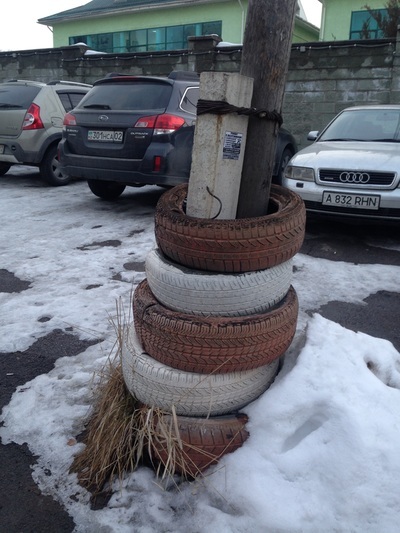 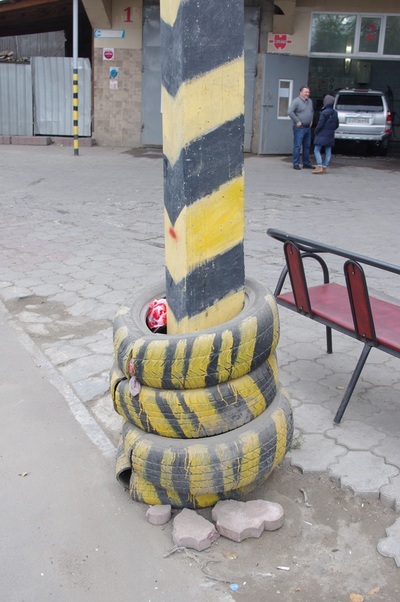 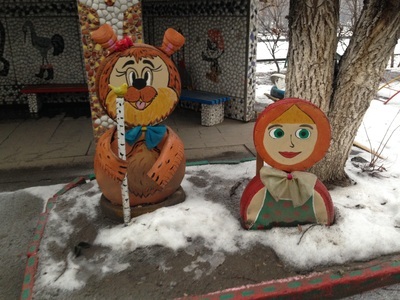 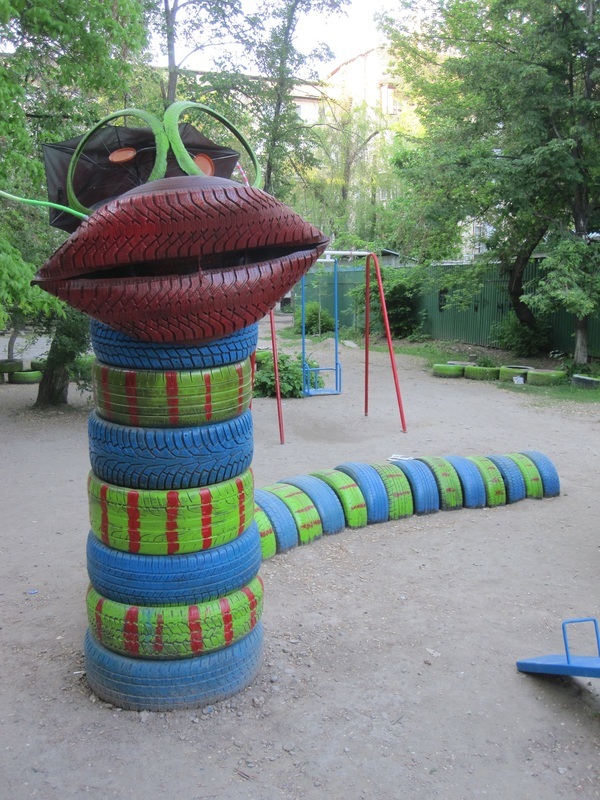 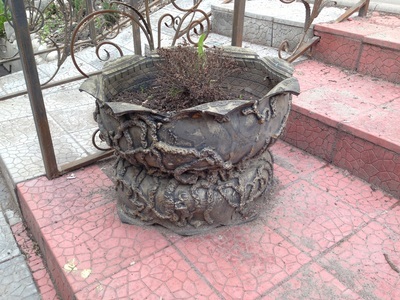 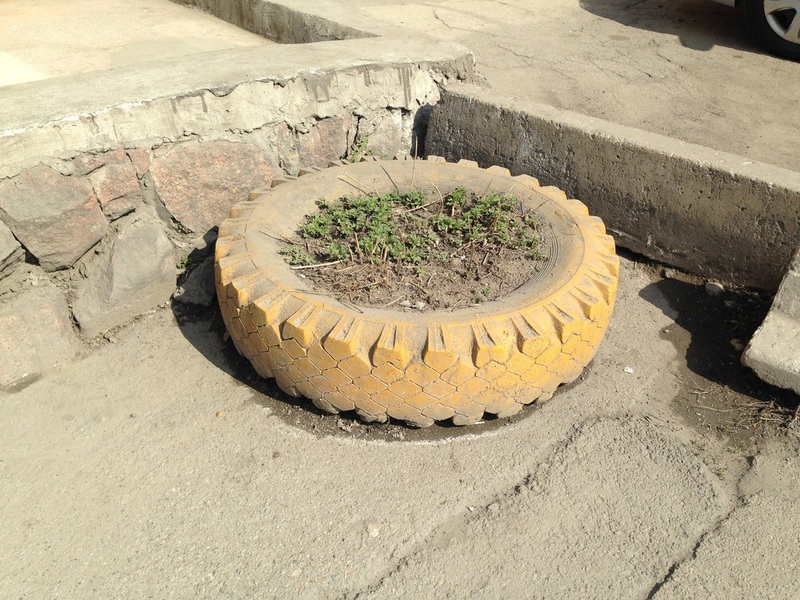 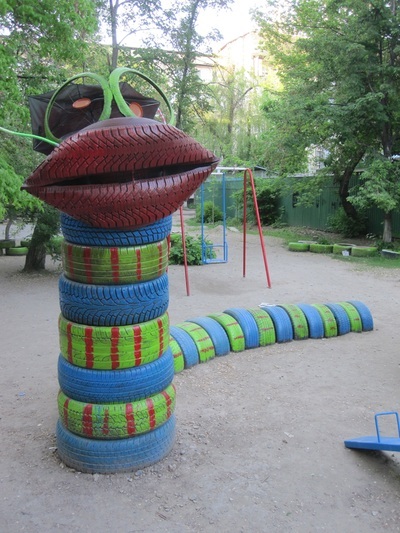 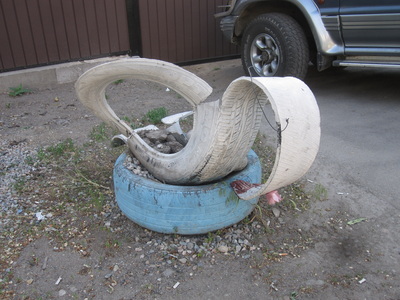 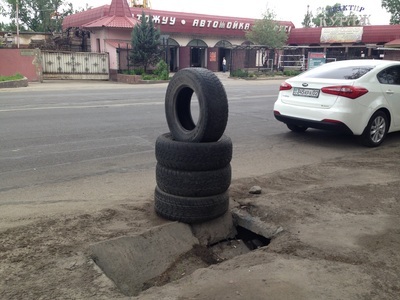 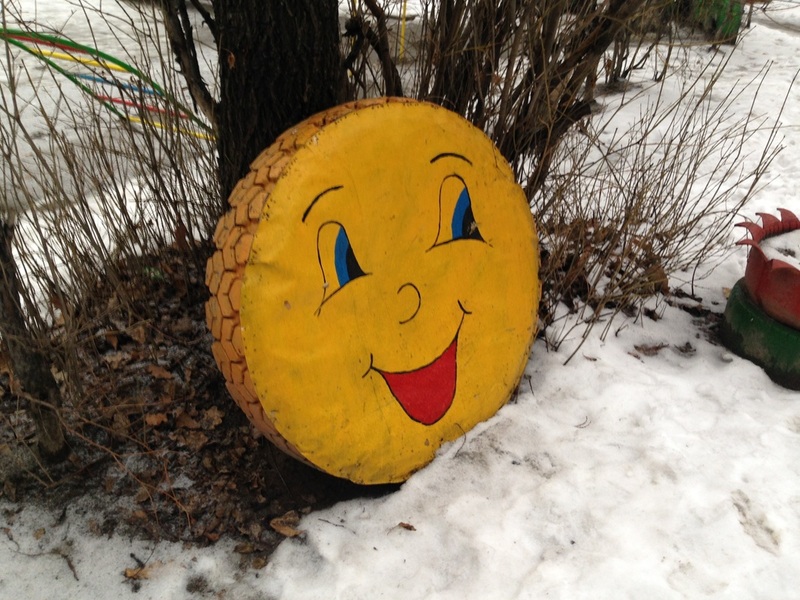 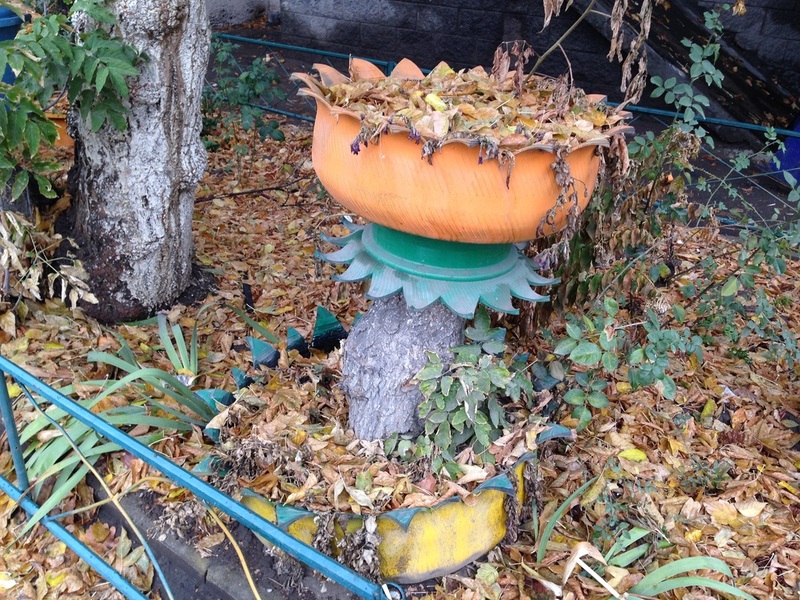 Most fun of all is the tire sculpture, a low-budget cousin of the wood and cement courtyard statues that also have their place in the Almaty imagination. 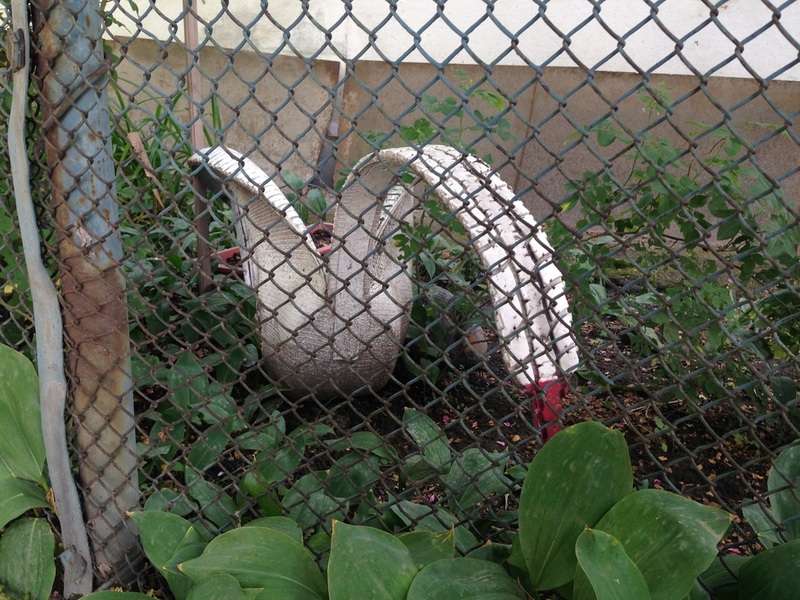 The tire swan in particular is a bona fide phenomenon, with dozens of YouTube tutorials and newspaper how-tos. We all know Russians love Swan Lake, and Akku [Аққу], the Kazakh word for swan, is both a famous dance and a legendary Almaty cafe, where live swans once swam before the place burned down (the swans, I think, were saved). 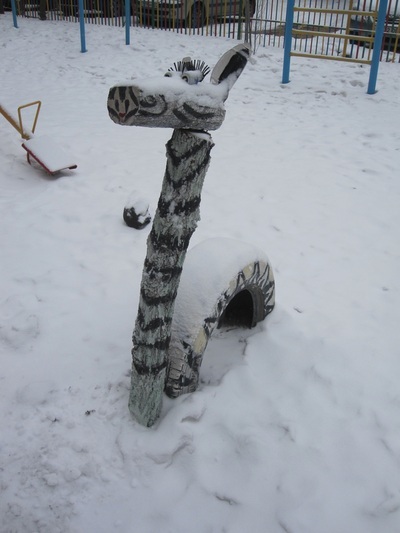 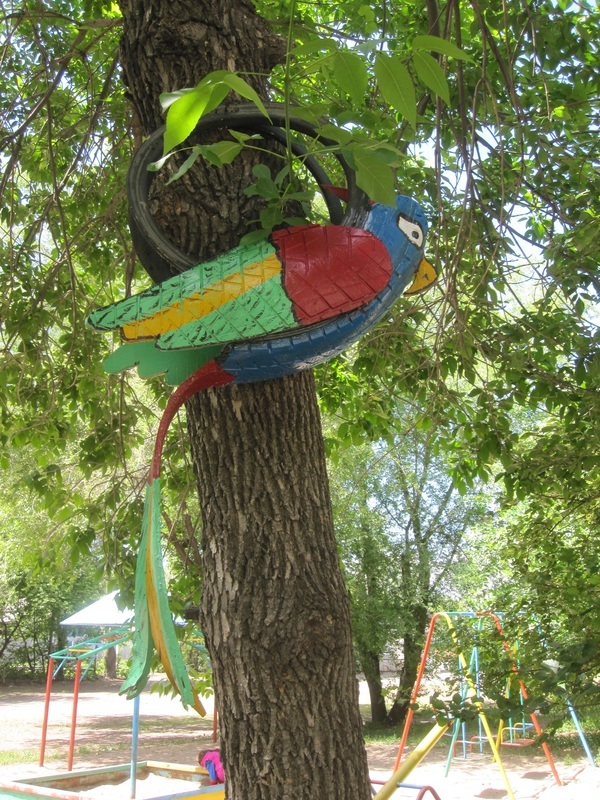 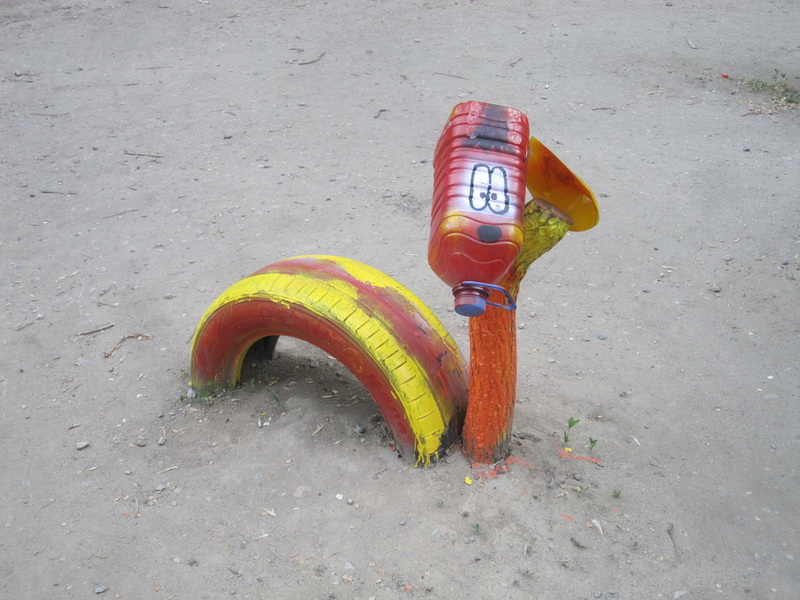 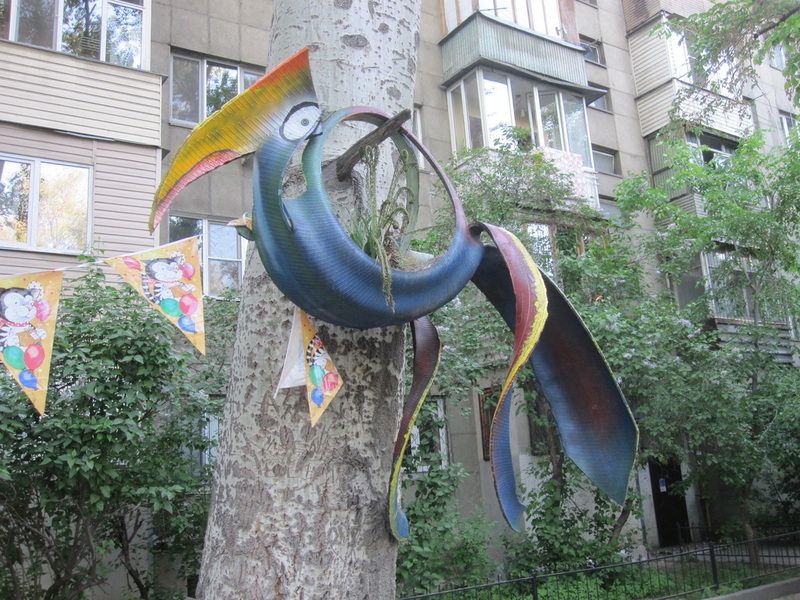 So the local denizens obviously have a thing for this bird, but other animals get their treatment too: tire parrots, tire giraffes, tire zebras and tire bears all live quiet lives on the city's shabby playgrounds. 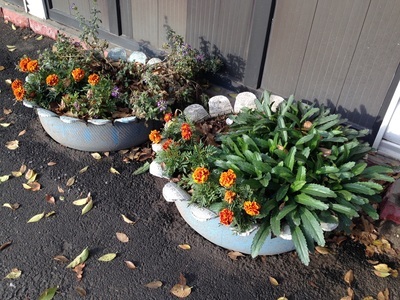 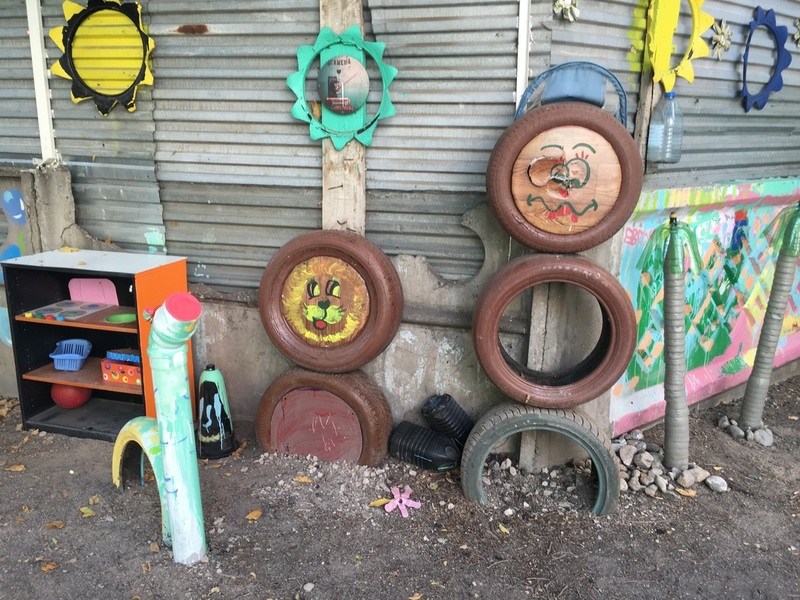 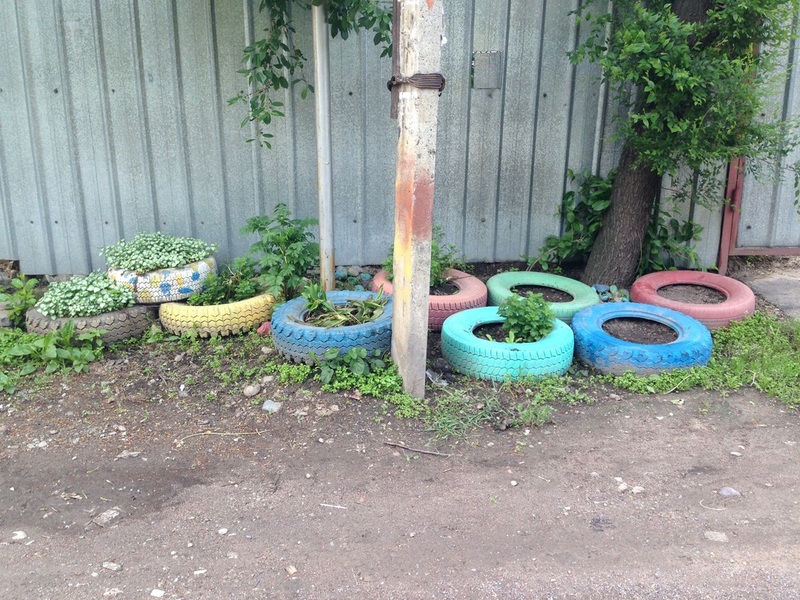 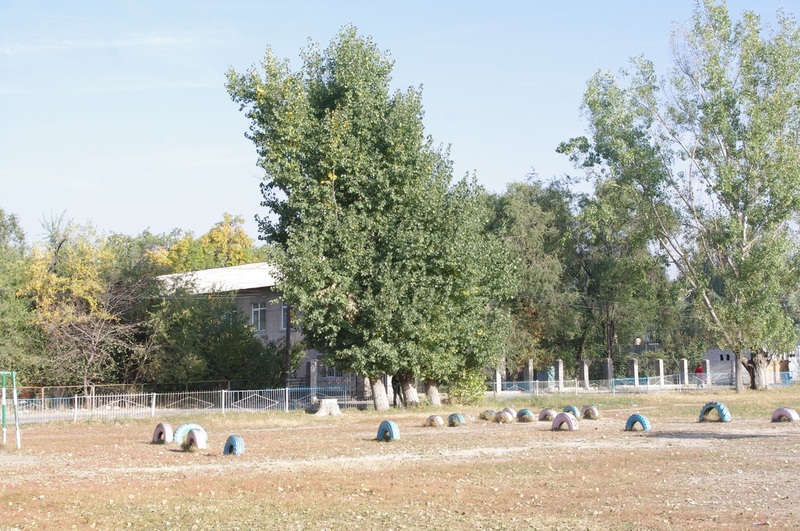 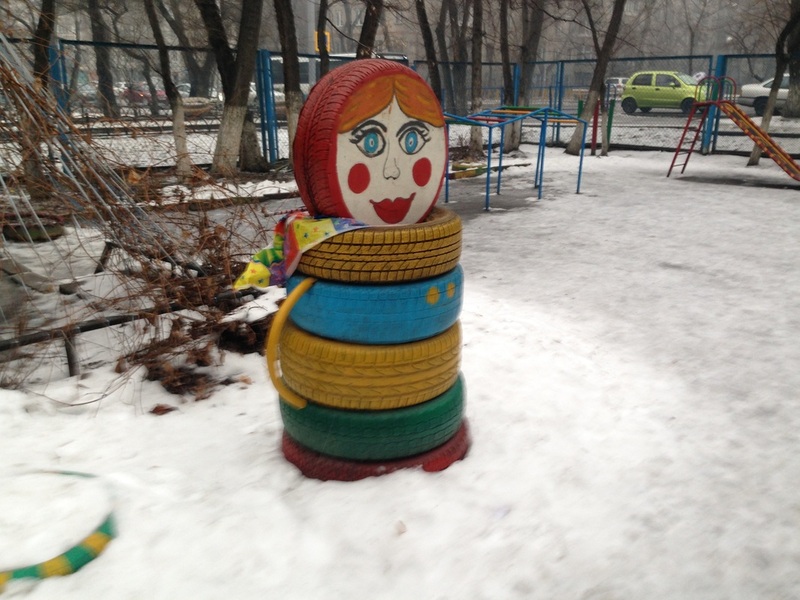 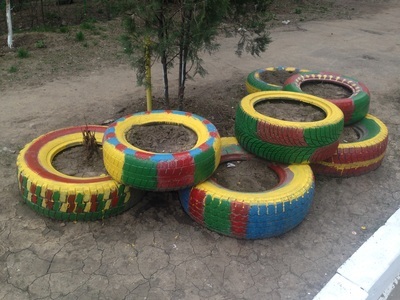 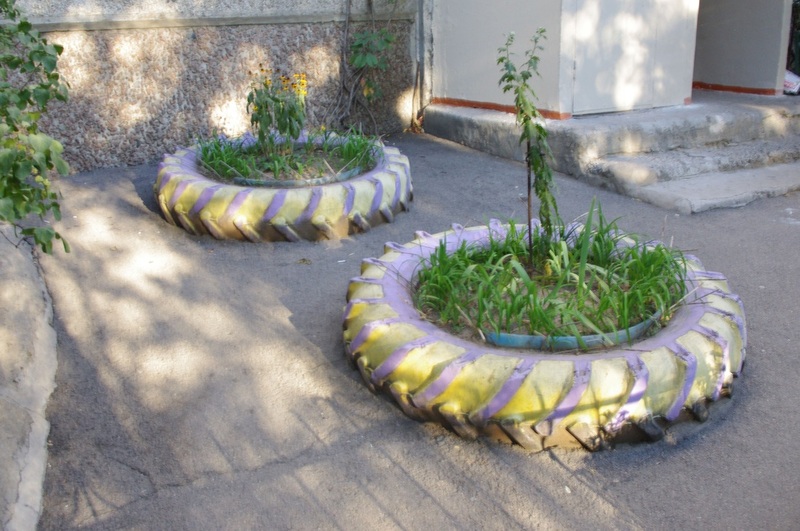 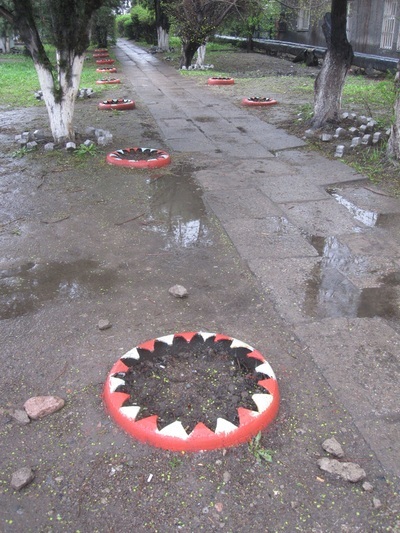 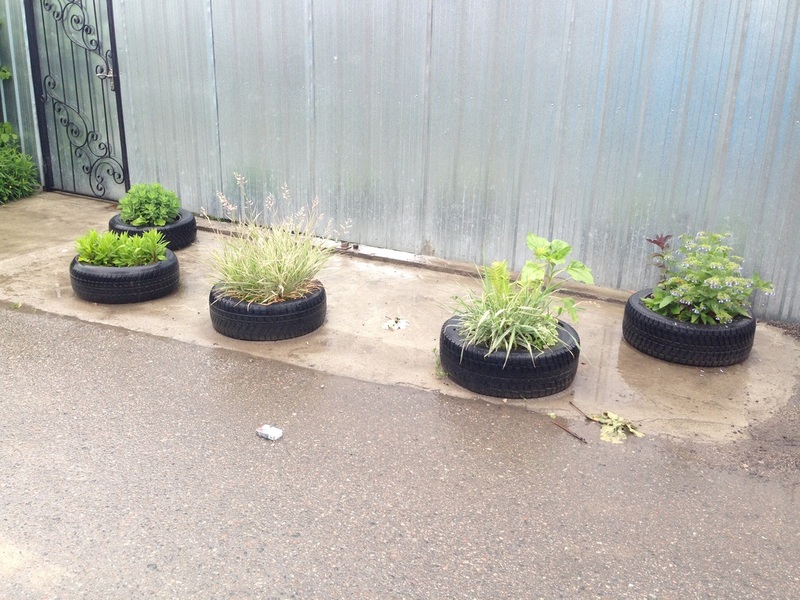 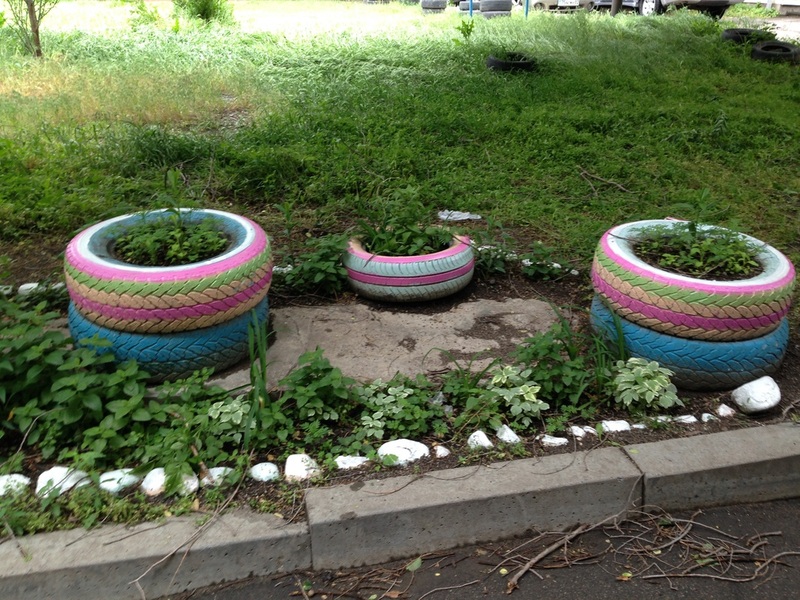 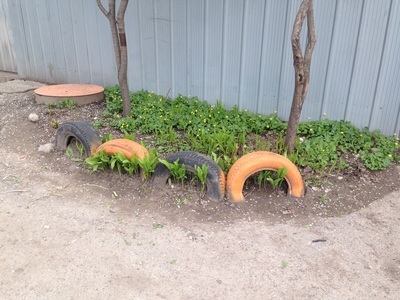 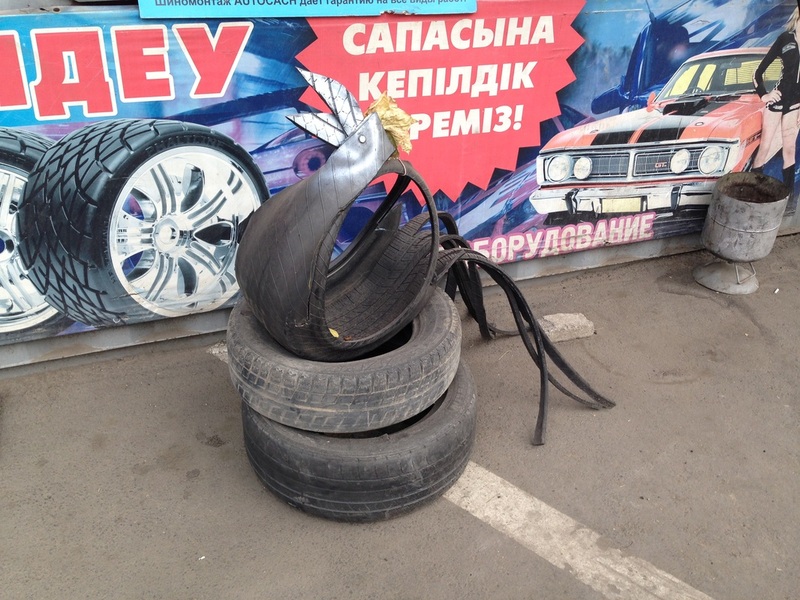 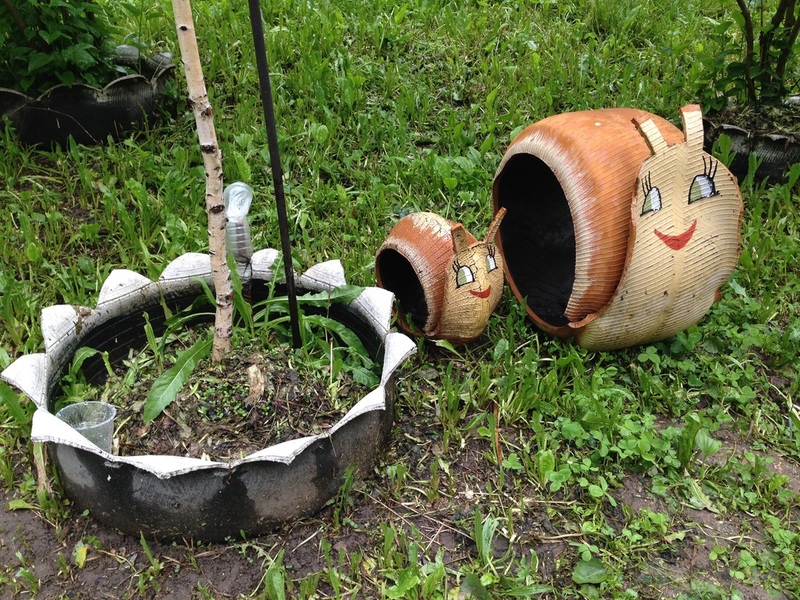 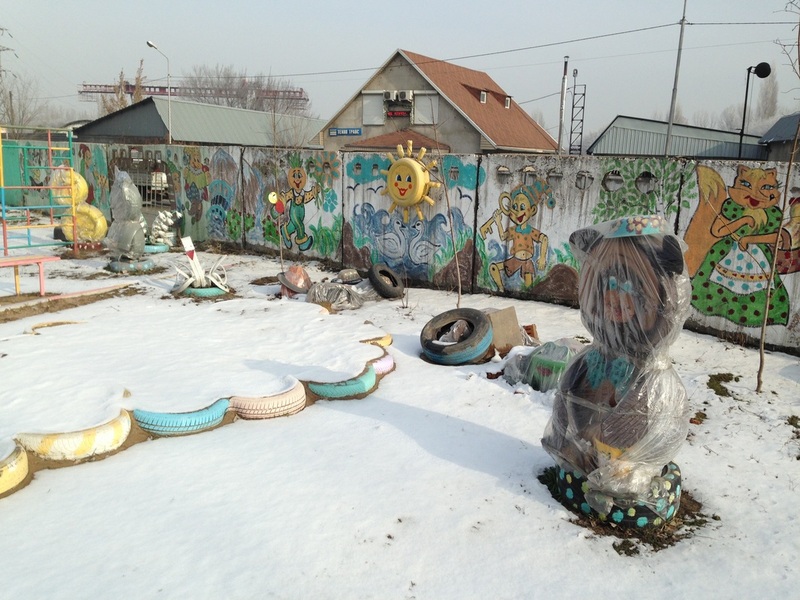 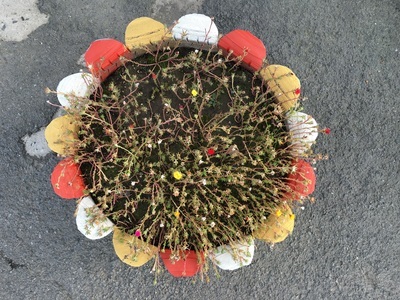 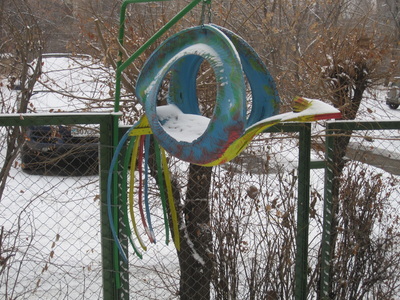 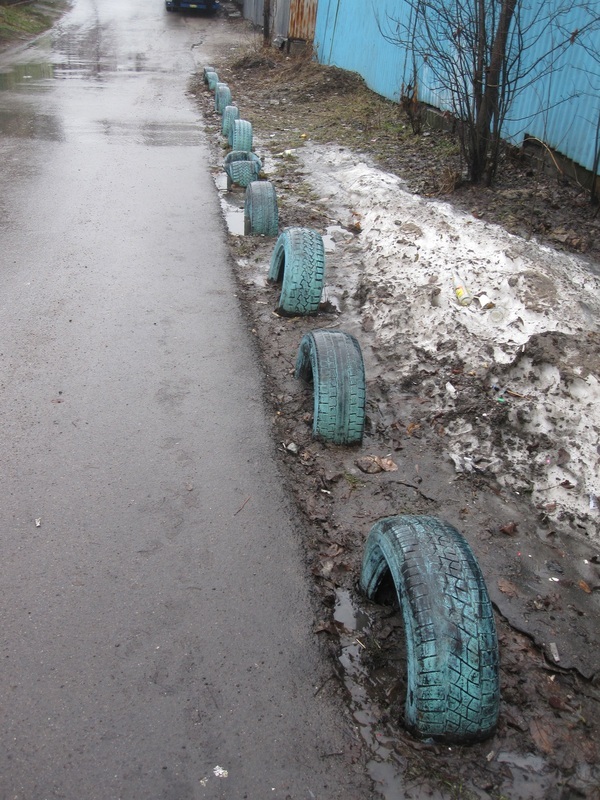 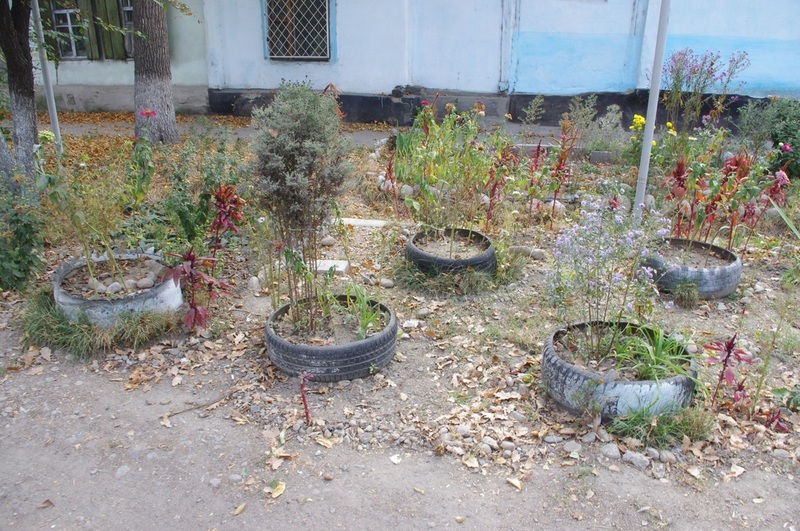 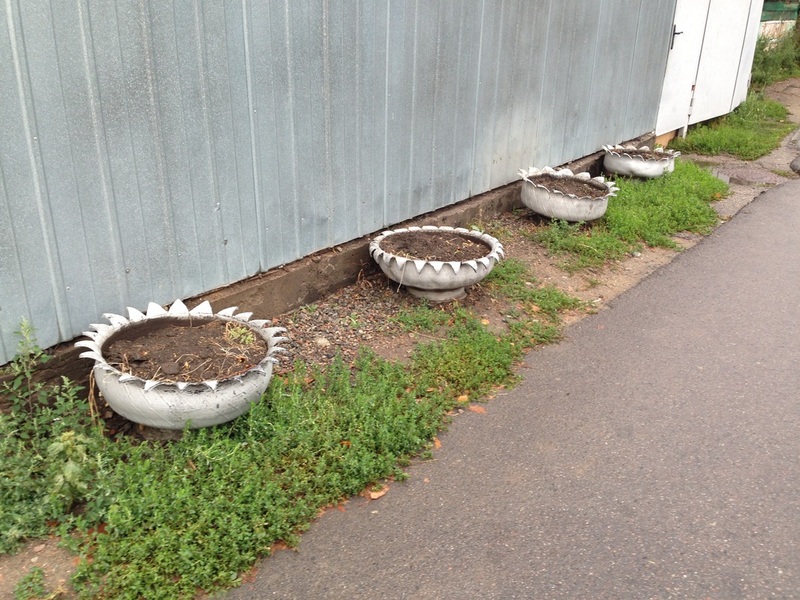 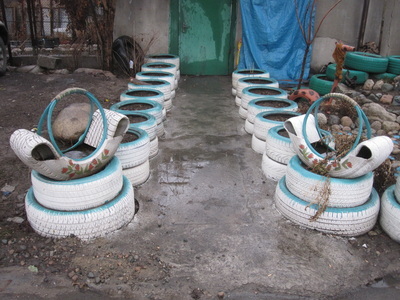 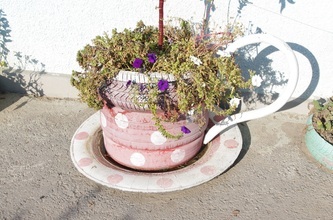 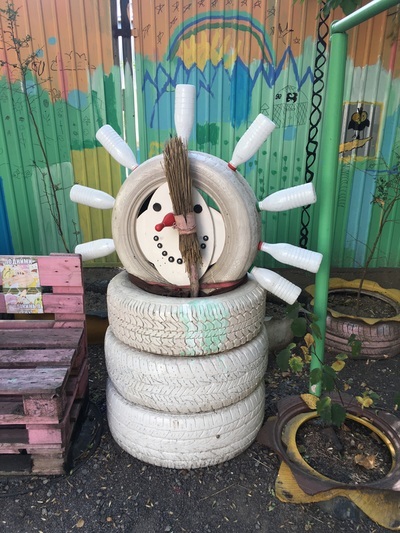 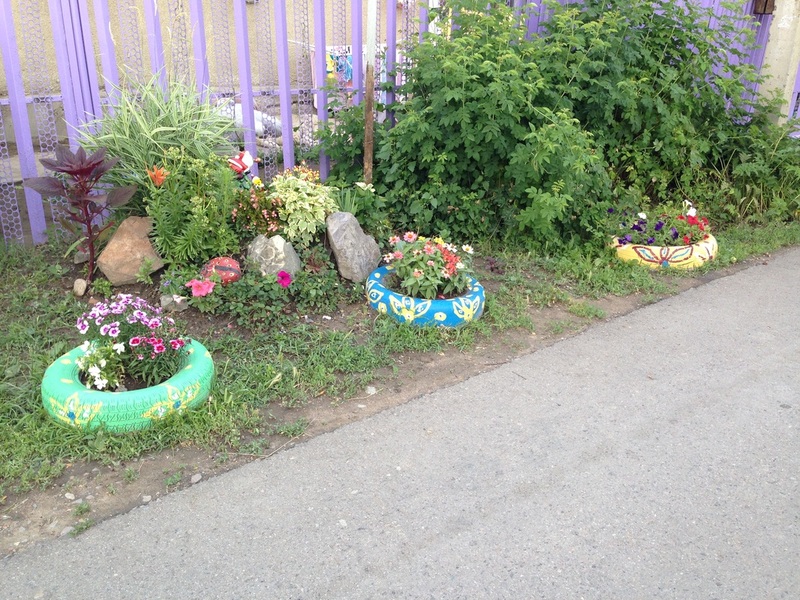 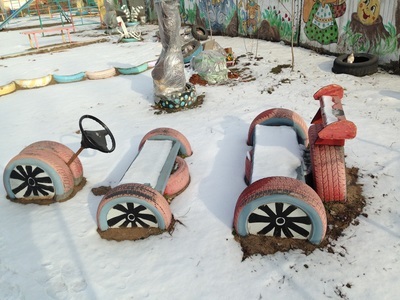 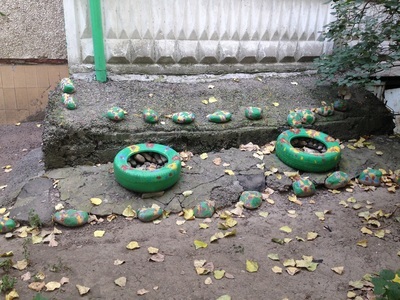 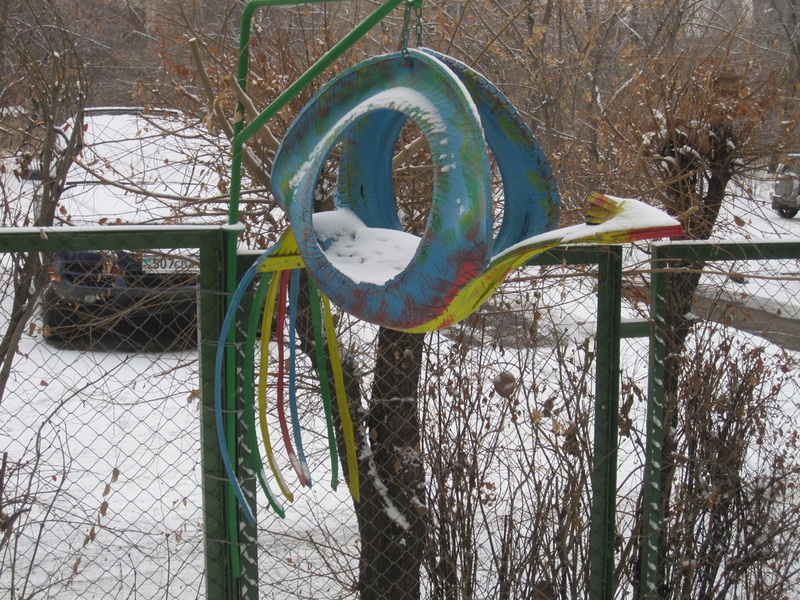 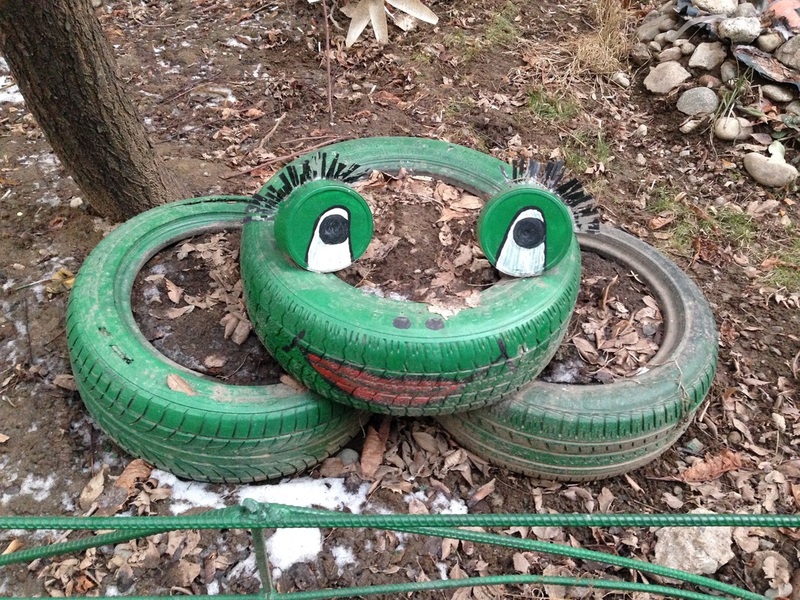 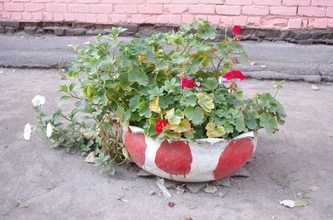 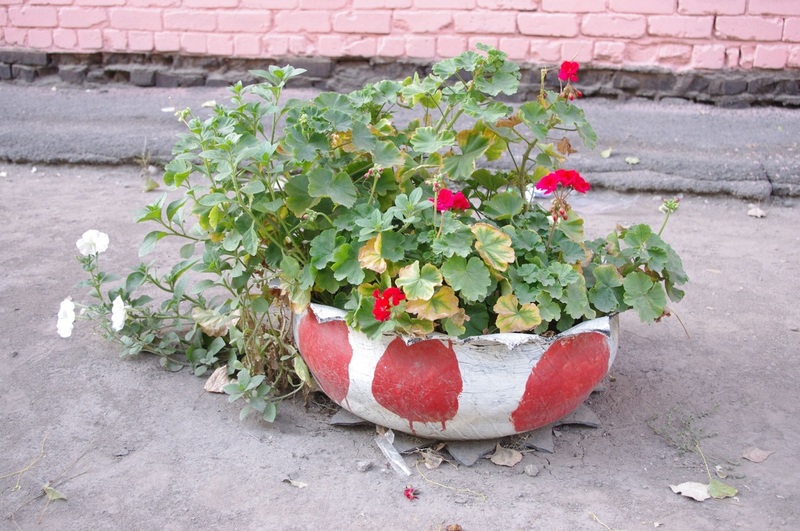 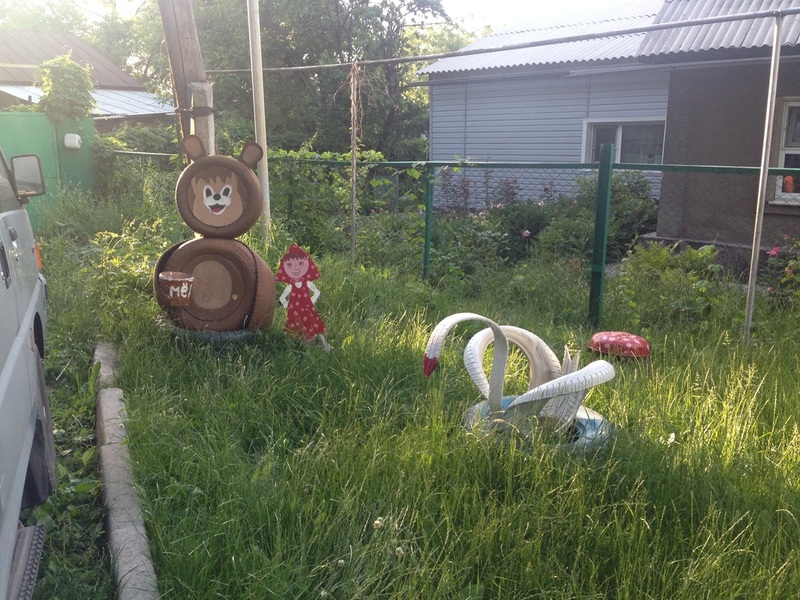 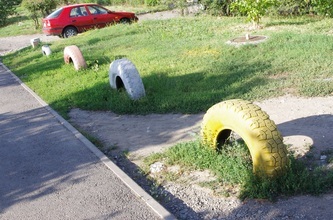 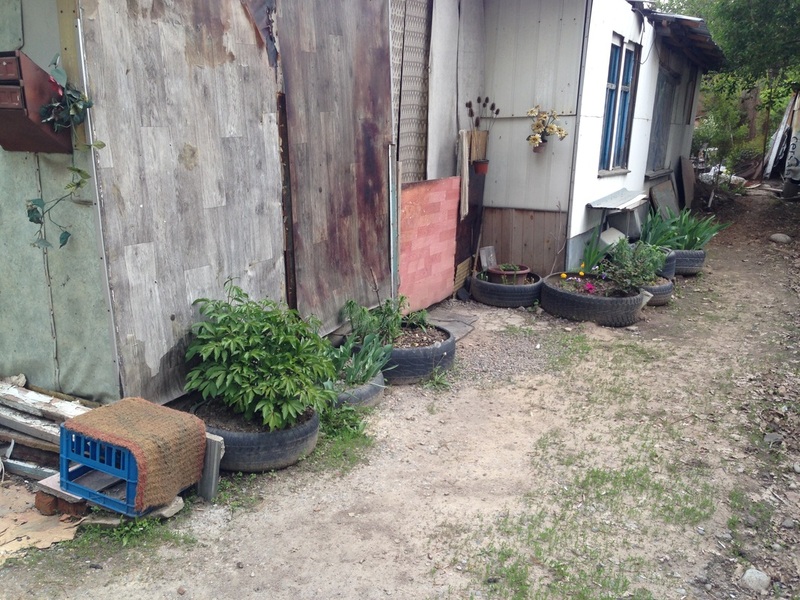 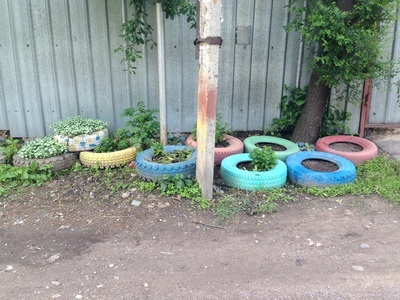 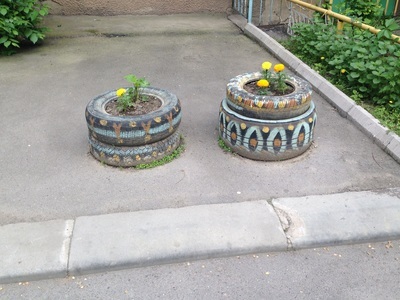 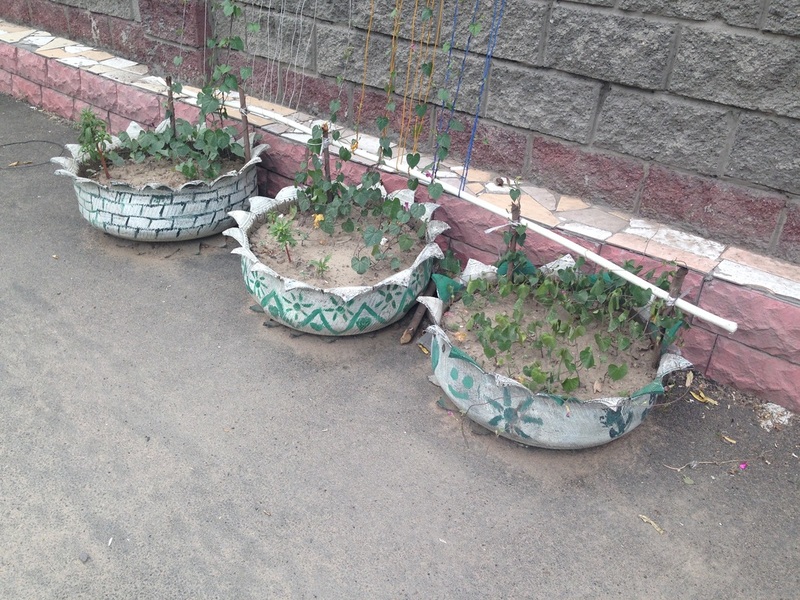 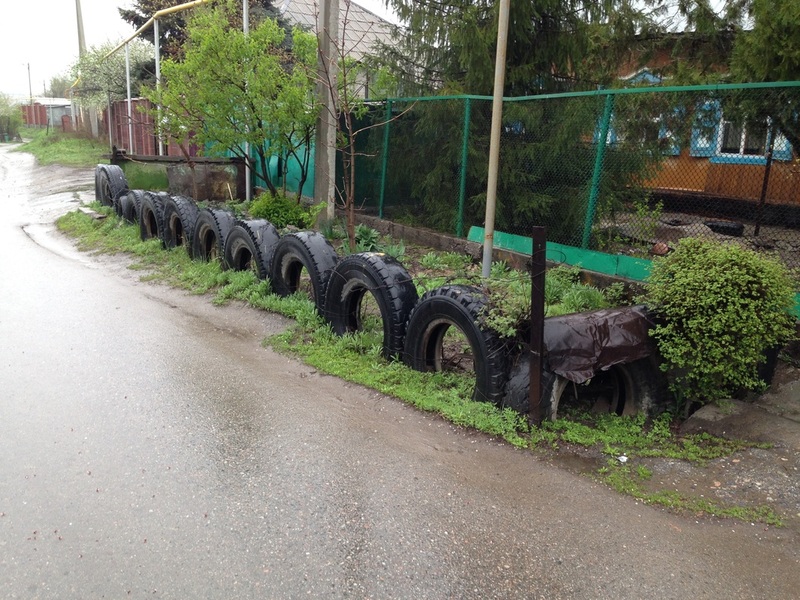 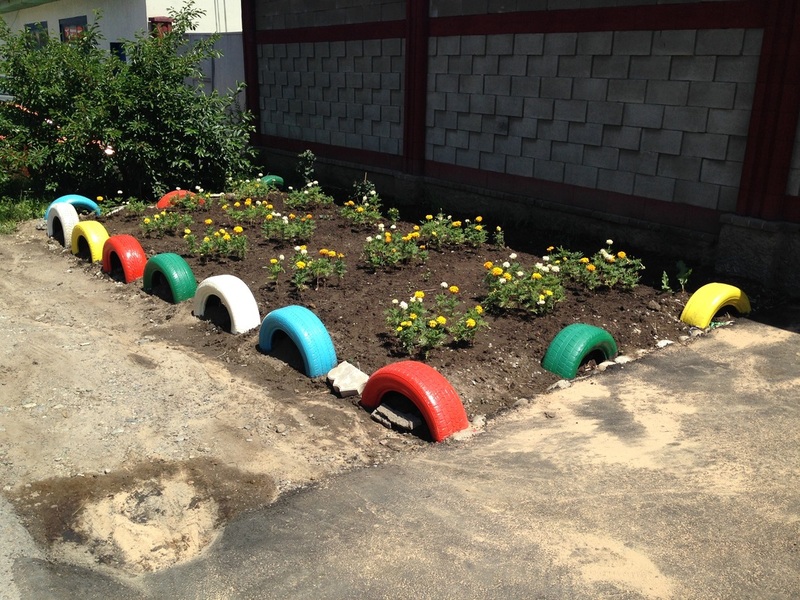 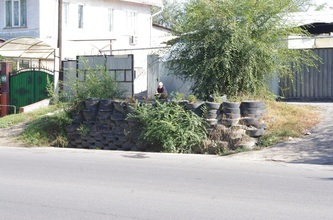 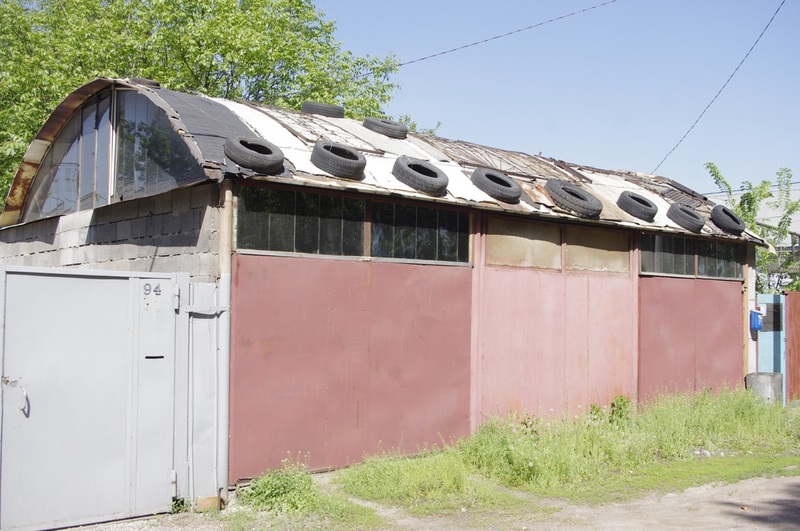 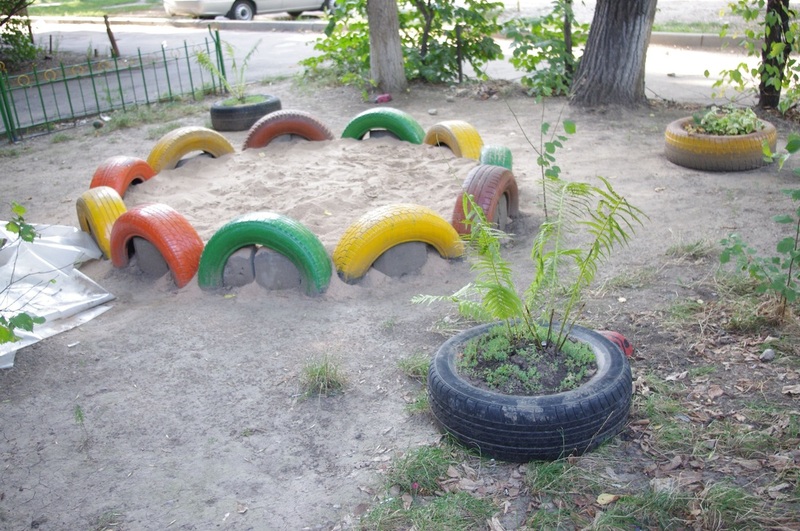 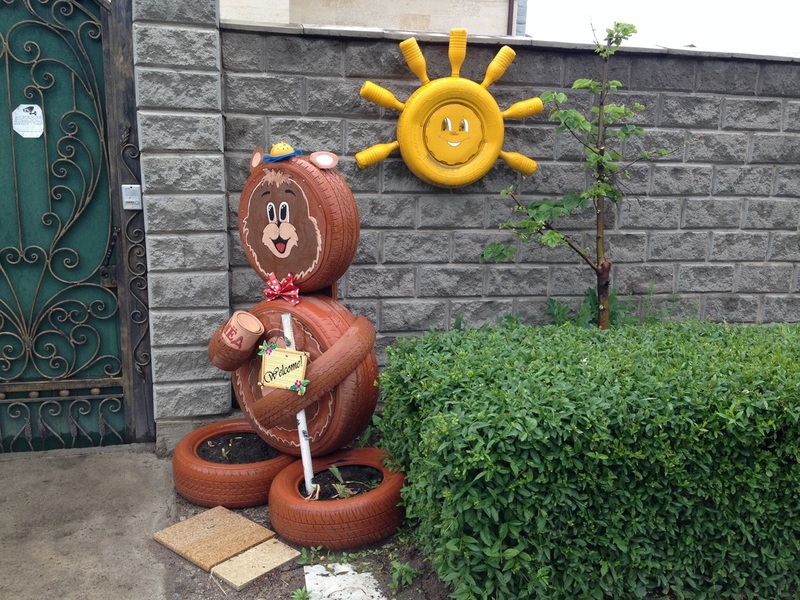 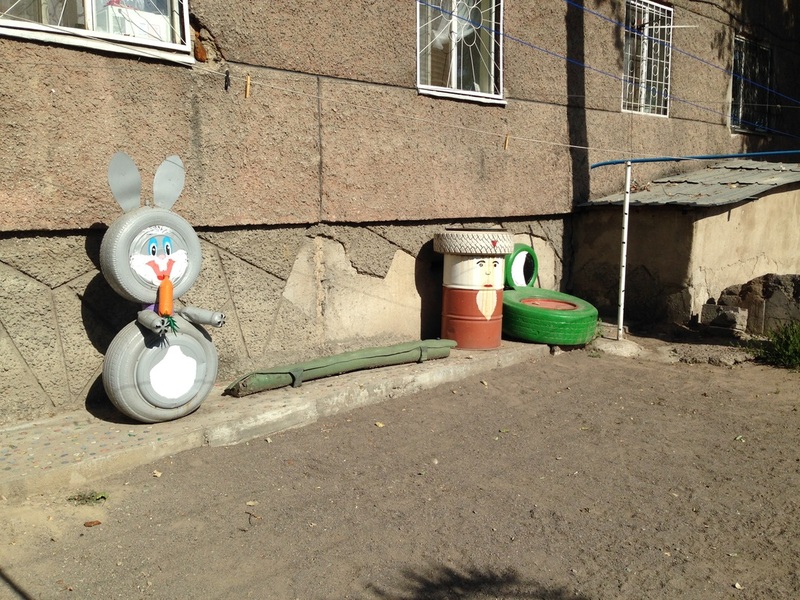 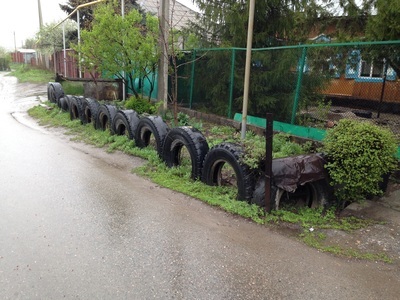 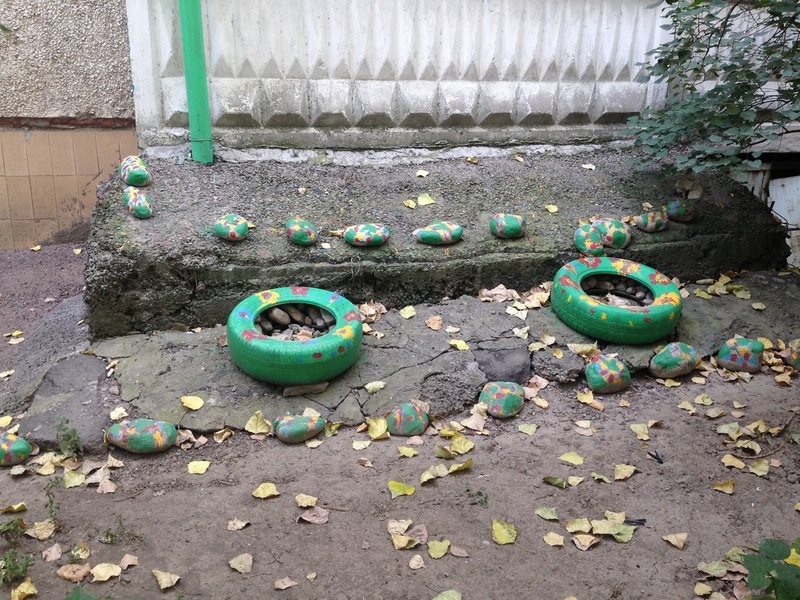 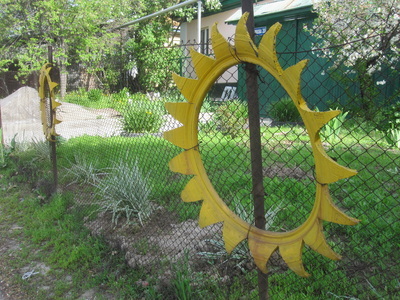 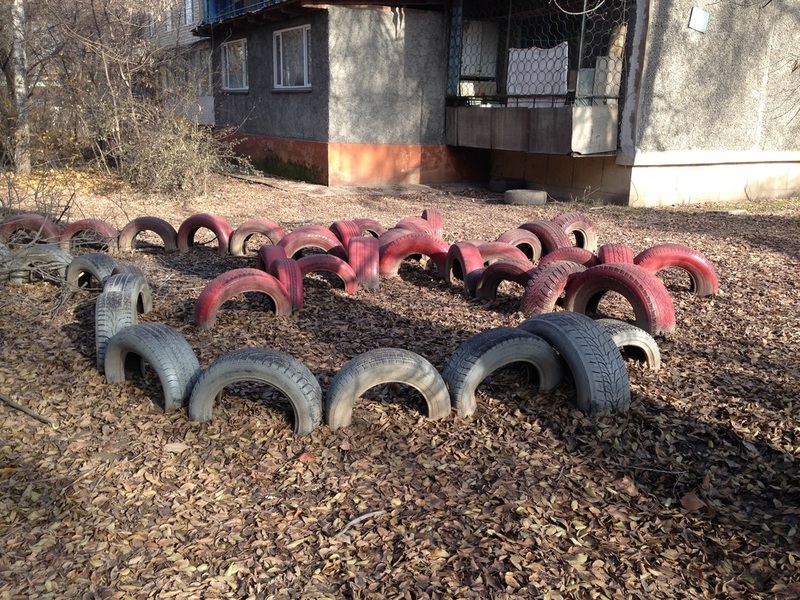 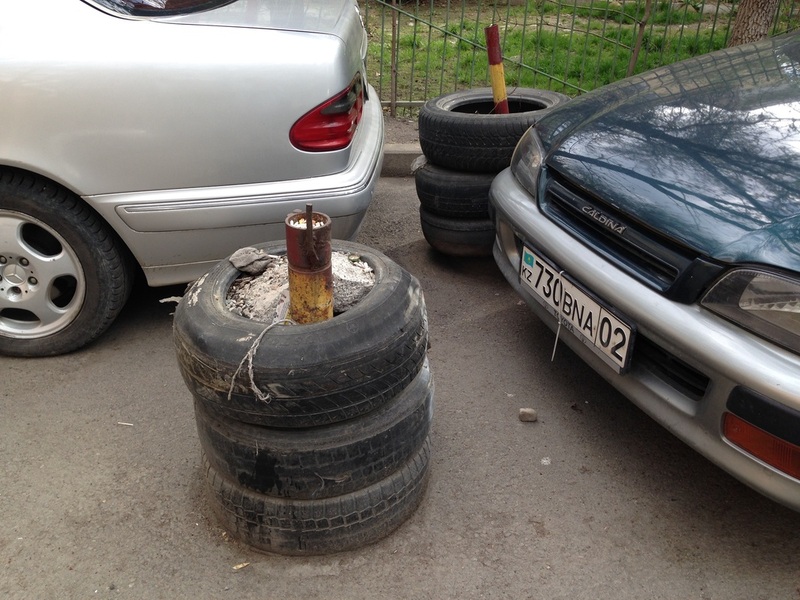 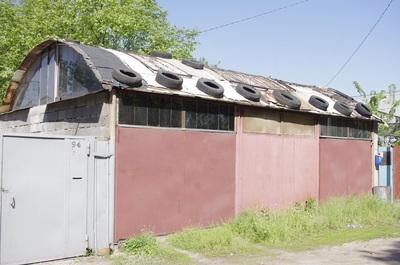 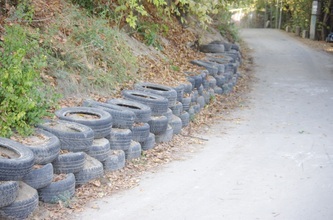 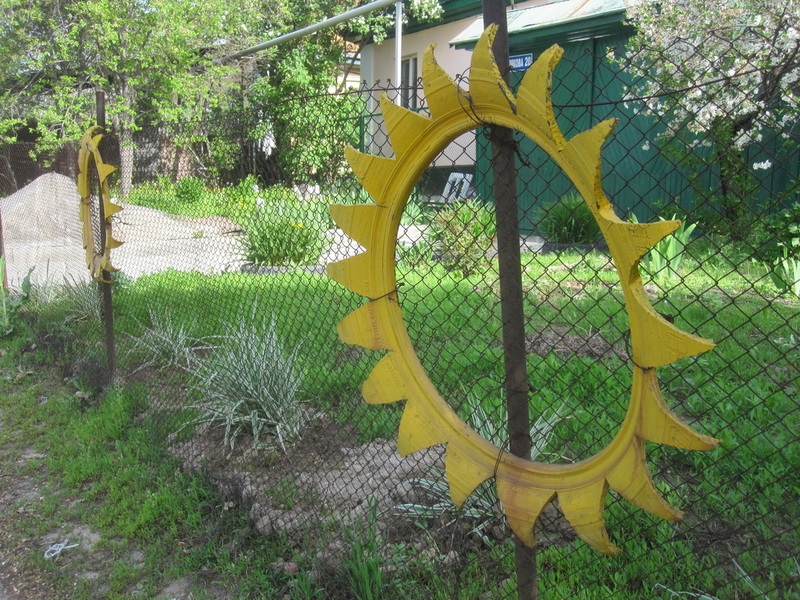 For many of these tire creations we can thank enterprising grandmas, but a lot of credit goes to organizations like Eto-Dvor [ЭТО-Двор], who fundraise, collect materials, and volunteer their time to install what they call "Eco-Yards" [Эко–площадки; Eko-ploshadky] throughout Almaty. 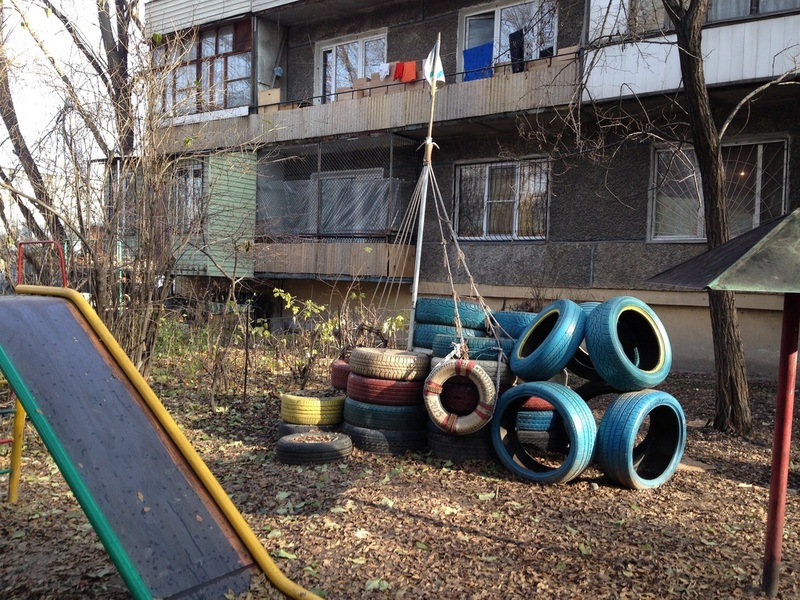 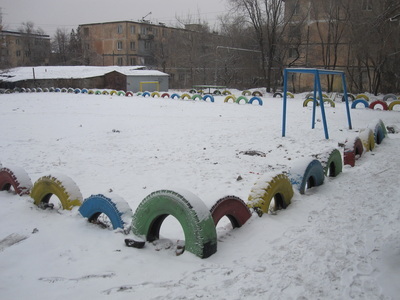 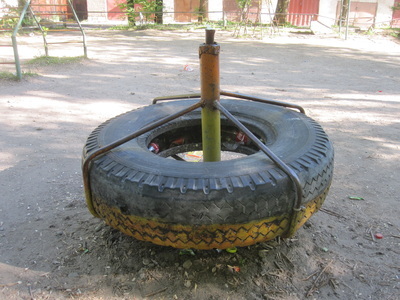 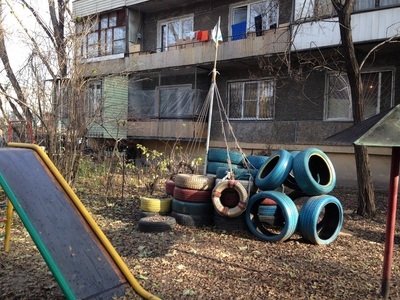 The old metal playgrounds from Soviet days are often in bad shape, so it's a great service to the community. And, as the group explains, kids can learn to look at things not just as consumable objects, but as opportunities for reinvention. 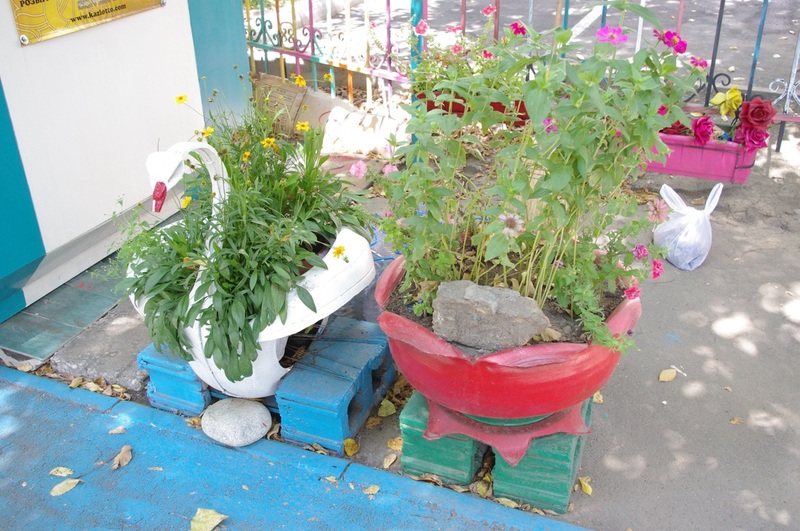 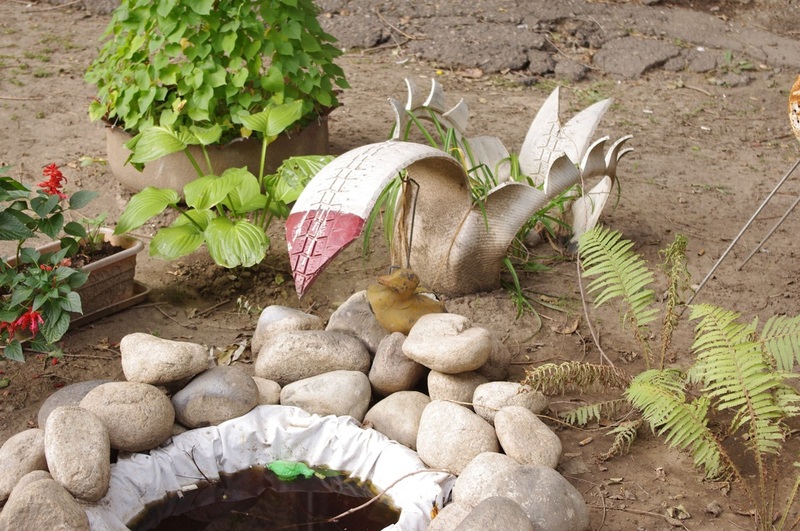 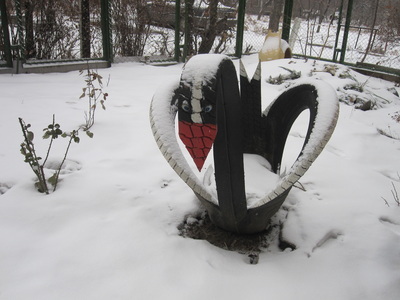 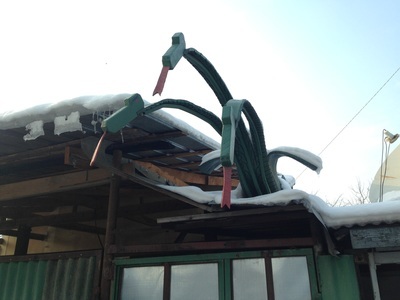 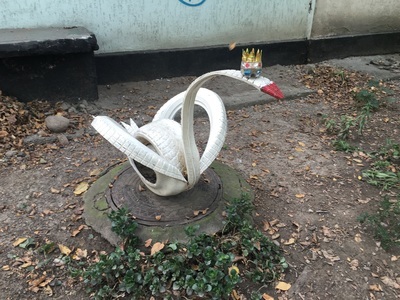 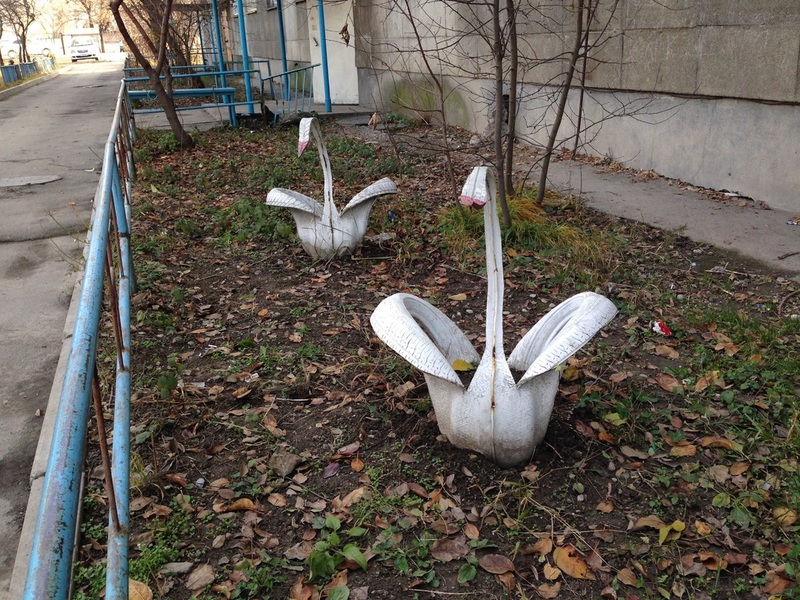 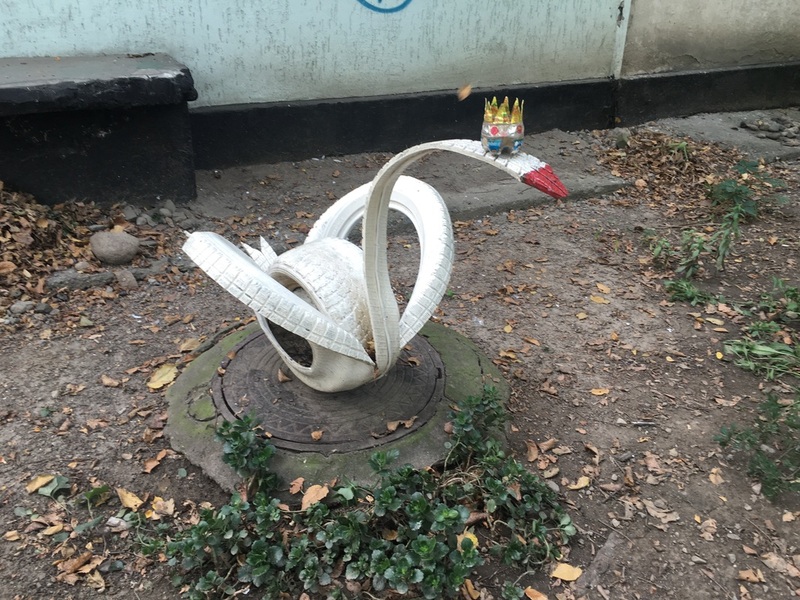 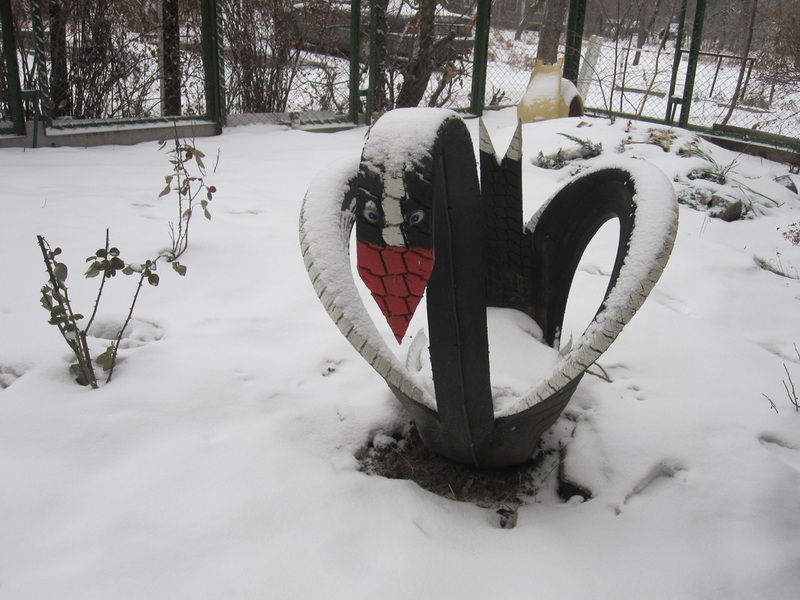 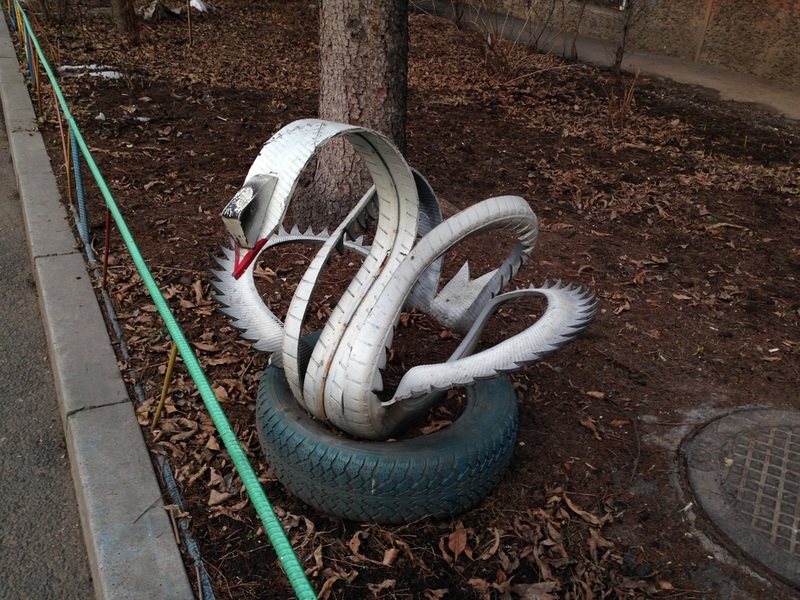 We can only hope the kids will grow up to make the next generation of Almaty tire swans, gracing Almaty's gardens for years to come.